I like getting post - as long as it isn't bills, and I love the idea of brightening up someones day. 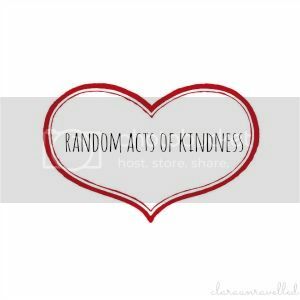 When I saw that Jess from Catch a Single thought was taking part in Clara's Random Acts of Kindness blog hop I thought I would join in too. If you want to take part, comment below. If you comment to recieve something, you need to blog and must promise to do/make/send something to as many people as you choose. I have decided to go for the first 4 people that comment. This isn't about money or extravagence - it is about unexpected happiness - so as Clara wrote it could be be anything from a handwritten letter to a knitted blanket, or a doodle or a favourite book. If you are one of the first 4 people to reply, email me on astrongcoffee@hotmail.com with your address. You will then recieve something from me in 2013.It is as simple as that, and I look forward to brightening up your day. will do - not sure what is going on, that will make my fourth post in 2 days! Off to drop r at the station, will do it when I get back. Though I doubt 4 people read my blog to comment!